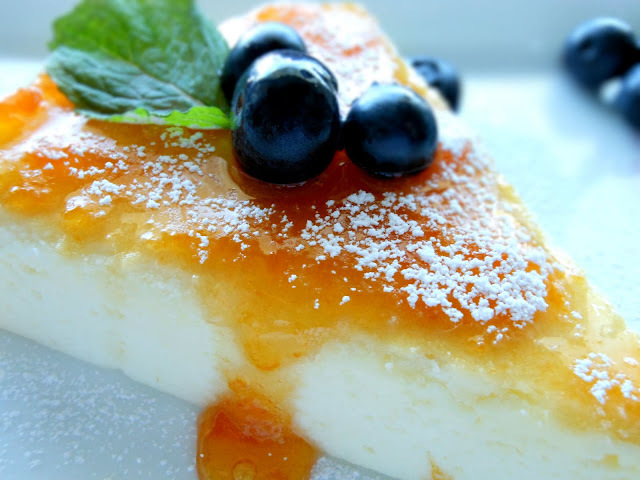 Japanese Cheesecake is known as a fluffy, light and creamy cheesecake. There are different versions of recipes you can find on the internet. I chose this recipe because it looks easy to make. I baked the Japanese Cheesecake for the first time today, and it turned out exactly as described. I think this is going to be my favorite cheesecake recipe. Grease a 9-inch cake pan. Beat cream cheese and milk until smooth. Add half of the sugar, egg yolks, corn starch, lemon juice and continue beating until smooth again. In a separate bowl, beat egg whites until foamy. Add the remaining sugar and cream of tartar to the foamy egg whites and beat until soft peaks form. Gradually fold egg white mixture into the cream cheese mixture. Pour into the cake pan and smooth the surface. Place cake pan into a larger roasting pan fill with water – half way up the side of the cake pan. For the glazing, mix jam and water together in a small microwavable bowl. Microwave it for a few seconds. Spread the glaze on top of the cake after it cools off.